Ankle replacement is surgery to replace the damaged bone and cartilage in the ankle joint. Artificial joint parts (prosthetics) are used to replace your own bones. There are different types of ankle replacement surgeries. Ankle replacement surgery is most often done while you are under general anesthesia. This means you will be asleep and not feel the pain. You may have spinal anesthesia. You can be awake but will not feel anything below your waist. If you have spinal anesthesia, you will also be given medicine to help you relax during the operation. Your surgeon will make a surgical cut in the front of your ankle to expose the ankle joint. Your surgeon will then gently push the tendons, nerves, and blood vessels to the side. After this, your surgeon will remove the damaged bone and cartilage. The lower end of your shin bone (tibia). 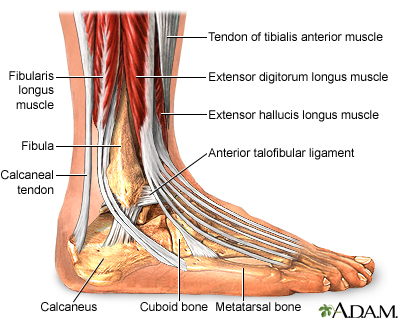 The top of your foot bone (talus) that the leg bones rest on. The metal parts of the new artificial joint that are then attached to the cut bony surfaces. A special glue/bone cement may be used to hold them in place. A piece of plastic that is then inserted between the two metal parts. The screws that may be placed to stabilize your ankle. The surgeon will put the tendons back into place and close the wound with sutures (stitches). You may need to wear a splint, cast, or brace for a while to keep the ankle from moving. You may not be able to have a total ankle replacement if you have had ankle joint infections in the past. Tell your provider if you have been drinking a lot of alcohol, more than one or two drinks a day. If you smoke, try to stop. Ask your provider for help. Smoking can slow down wound and bone healing. It will significantly increase your complications after surgery. You may want to visit the physical therapist to learn some exercises to do before surgery. The physical therapist can also teach you how to correctly use crutches. After surgery, you will most likely need to stay in the hospital for at least one night. You may have received a nerve block that controls pain for the first 12 to 24 hours after surgery. Your ankle will be in a cast or a splint after surgery. A small tube that helps drain blood from the ankle joint may be left in your ankle for 1 or 2 days. To keep swelling down, keep your foot raised higher than your heart while you are sleeping or resting. You see a physical therapist, who will teach you exercises that will help you move more easily. You most likely will not be able to put any weight on the ankle for a few months. In most cases, total ankle replacements last 10 or more years. How long yours lasts will depend on your activity level, overall health, and the amount of damage to your ankle joint before surgery. Barg A, Saltzman CL. Ankle replacement. In: Coughlin MJ, Saltzman CL, Anderson RB, eds. Mann's Surgery of the Foot and Ankle. 9th ed. Philadelphia, PA: Elsevier Saunders; 2014:chap 22. Hansen ST. Post-traumatic reconstruction of the foot and ankle. In: Browner BD, Jupiter JB, Krettek C, Anderson PA, eds. Skeletal Trauma: Basic Science, Management, and Reconstruction. 5th ed. Philadelphia, PA: Elsevier Saunders; 2015:chap 68.